While most of the recent attention has been on its next door neighbor, Pad 39B is making good progress towards its new role in hosting the Space Launch System (SLS) – and potentially other rockets – with a major milestone completed this month. The last of over 93,000 new bricks was laid in the Flame Trench, setting the stage for the installation of the new Flame Deflector next month. The Kennedy Space Center’s two main pads – 39A and 39B – were originally constructed in the 1960s. Pad 39B was the launch site for one Apollo/Saturn V launch, three Skylab missions using the Saturn 1B rocket, one Apollo-Soyuz Test Project mission that also used a Saturn 1B, and 53 space shuttle launches. Next door, Pad 39A – now under the control of SpaceX – will host its 100th launch with the Falcon 9 mission to loft the CRS-11 Dragon to the International Space Station (ISS). Drawings of the original pad 39B were completed by Giﬀels and Rosetti Inc. of Detroit in October 1964. Construction of the pad began in December 1964 and was completed in April 1967. The design and construction supervisors were the Canaveral District of the U.S. Army Corps of Engineers. The construction was a huge undertaking, with hundreds of tons of sand dredged from the Atlantic Ocean and pumped along a road to the pad bases, with the structure comprising of 68,000 cubic yards of concrete and 5,100 tons of reinforced steel. Both 39B and 39A were complete facilities, with fuel and oxidizer tanks, environmental control system room, pad terminal connection room, camera stations, electrical equipment buildings, a water chiller facility, an emergency egress facility, and operations offices. They were near-identical in construction, with the only major diﬀerence being 39B actually sits seven feet higher (55 feet) above mean sea level. 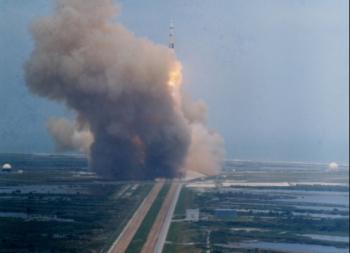 The first launch from 39B was Apollo 10 on May 18, 1969. It also was the first real use of the pad’s water deluge system, used to cool the ﬂame deﬂector in the ﬂame trench after rocket ignition. 39B was used to launch three of the four missions of the Skylab program. The crewed missions were Skylab 2 on May 25, 1973; Skylab 3 on July 28, 1973; and Skylab 4 on November 16, 1973. The crewed Apollo-Soyuz Test Project mission launched from pad B on July 15, 1975. The pad would then undergo major changes for its new era with the Space Shuttle Program, which saw modifications begin in 1979. In October 1980, a $6.7-million contract was awarded to W&J Construction Corp. of Cocoa, Florida, to install the ground support equipment within the pad 39B complex. 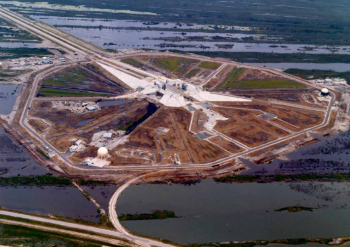 This work was completed in 1985, in time to host its first Shuttle launch early the next year. That historic debut Shuttle mission from 39B would prove to be the tragic launch of Challenger on STS-51L. Pad 39B notably was part of the Shuttle’s comeback as it hosted the launch of Discovery on the subsequent Return To Flight mission. Other flagship missions included STS-31 carrying the Hubble Space Telescope on April 24, 1990, and STS-61, the first servicing mission to Hubble on December 2, 1993. The pad also saw Endeavour’s maiden flight set sail on May 7, 1992, and John Glenn’s return to space, on STS-95, on October 29, 1998. 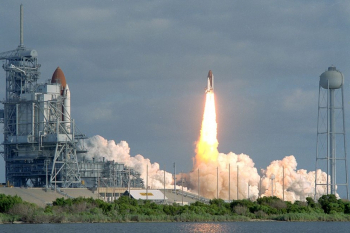 The final launch was Discovery’s STS-116 mission December 9, 2006. By this time, NASA was already looking towards a Shuttle replacement, via the Constellation Program (CxP). 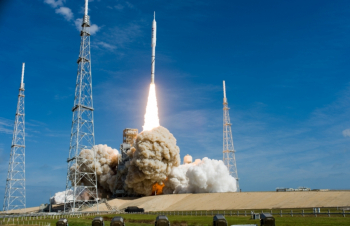 Per the test program, 39B was modified to handle the launch of NASA’s Ares 1-X rocket on a test ﬂight October 28, 2009. With CxP canceled not long after the Ares I-X test, 39B underwent more visually dramatic changes in preparation to become a “clean pad” for SLS. With all the Shuttle era structures removed engineers have since installed new communications and wiring system; replacement of the Environmental Control System; new heating, ventilation and air conditioning systems; and replacement of various water system pipes within the pad perimeter. Installation of new ignition overpressure/ sound suppression bypass valves at the valve complex; reinforcement and replacement of the pad surface crawlerway; and refurbishment of the pad’s cryogenic propellant storage spheres also are underway. A huge amount of work has been taking place in the Flame Trench, with the installation of heat-resistant bricks, in three diﬀerent sizes, to the walls using bonding mortar in combination with adhesive anchors. 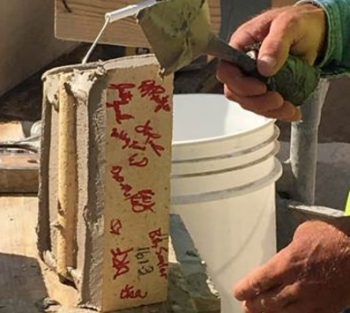 Three years after the effort began, this month marked the setting of the final new brick in the flame trench, which was signed by construction workers. The total count of new bricks installed was a staggering 93,645 bricks. 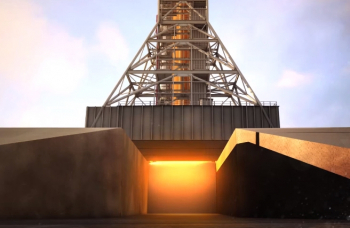 The ﬂame trench will be able to withstand temperatures of up to 2,000 degrees Fahrenheit at launch of the rocket’s four RS-25 engines and twin Solid Rocket Boosters. A new ﬂame deﬂector will divert the rocket’s exhaust, pressure and heat to the north side of the ﬂame trench. Two side ﬂame deﬂectors, repurposed from space shuttle launches, are being refurbished and will be reinstalled at pad level on either side of the ﬂame trench to help reduce damage to the pad and the SLS rocket. Preparations for the Flame Deflector in the floor of the trench is well under way, with steel erection set to start early in June. The work is designed to allow Pad 39B to cater for the thrust levels expected from the top-of-the-range SLS Block 2, which won’t debut for at least another 10 years. Interestingly, the clean pad design – and huge capability to cope with high thrust launches – also allows for it to host other large-power rockets, which may provide an option to commercial companies on the Space Coast.